Crime Alert!! Cheesy Cartoons looks at Teen Titans Go!! It’s the Pirate vs the Mage in Screw Attack’s DEATH BATTLE!! 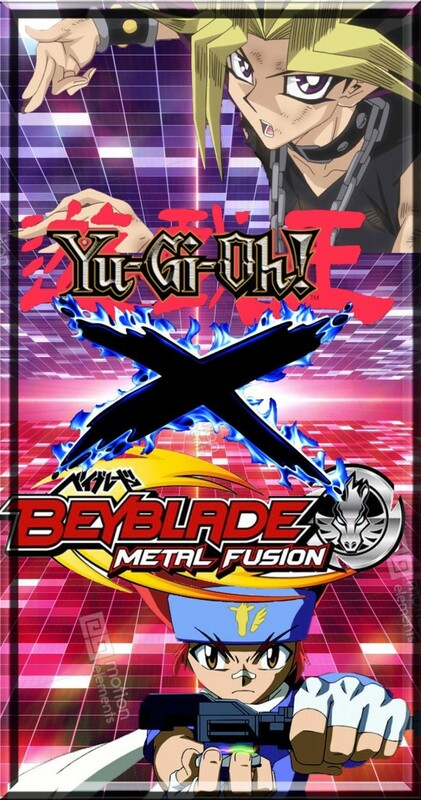 Yu-Gi-Oh X Beyblade Chapter 6 Pt.1!! Yugi and his newfound friends are nearing the Uruborus Corporation office building of Victor Amadeus. It is a large midnight blue building the rises high above the others. It almost reminded Gingka and his friends of the Dark Nebula Organization building. They had heard that a foreign developer had come to Japan a short time ago with plans to build brand new state-of-the-art Bey Stadiums. As of late, that was the only announcement. Today’s broadcast is the first anyone has heard from Victor in a while. Perhaps he was planning for this. Is he truly some sort of god? Did he really bring Yugi from another world into theirs? Rather than think of the various possibilities, Gingka and his friends stay focused in reuniting Yugi with his. They reach the entrance to the building. Madoka is on her phone talking to Tsubasa about the situation. “What did Tsubasa say, Madoka?” asked Gingka. “A relative of his back in his home village is sick. He’s on his way there to help out. He saw the broadcast and wants to help but it’ll be a couple hours before he gets here,” Madoka tells him. “Oh, that’s too bad. We sure could use his help but family comes first,” said Gingka. “Hey guys!” came Tsubasa’s voice. “Hey Tsubasa!” Gingka said. Benkei, Kenta and Yu greet him as well. “Sorry I couldn’t be there to help you guys out but my family needs me here right now,” Tsubasa says. “Don’t be sorry. Family just as important as friendship. We’ll be fine. We have Kenta and Benkei here,” Gingka assures him. “Don’t you worry about a thing, Tsubasa! We got this!” Benkei bellowed excitedly. “Thanks, Tsubasa! I hope your relative feels better!” said Gingka. “Thanks! I’ll tell them you said that. Later!” Tsubasa said back. After wishing Tsubasa goodbye, Madoka closes her phone. “You bet!” Yugi replied enthusiastically. “Then let’s get in there and get your pals back!” Benkei bellowed with excitement. Yu giggles happily. “This is going to be so much fun!” he says. Gingka, Benkei, Kenta and Yu ponder the notion. They know Masamune can be very outspoken and has a high tendency to speak without thinking. Even though he is devoted to his friends, Masamune can be annoyingly forthright. He most assuredly would have rushed inside the building just to challenge the first person he sees to a Beyblade battle. Right now, they don’t need that kind of ruckus. “Yeah, he would just be loud and obnoxious as usual,” Yu commented. “He can be annoying,” Kenta added. “I can imagine him trying to rush back here after that announcement,” said Madoka. The door to the midnight blue office building closes behind them. Meanwhile in America, a flight attendant at an airport is having an issue with a young man wearing a green sweat shirt with an orange shirt underneath, khaki shorts, black hair with white streaks and a strip of red hair poking forward. He rushed to the front of the line anxious to get the next flight to Japan. The people behind him stab him profusely with their eyes. The attendant does her best to keep her composure. “I’m sorry, sir. But there are no available flights to Japan until this afternoon,” she says politely. “Aw come on! There’s gotta be something! Don’t you understand! There’s a Beyblade tournament I have to get to! I’m Japan’s representative from the Beyblade World Championships!” Masamune said loudly. The flight attendant is becoming irater by Masamune’s obnoxiousness. But she retains her pleasant demeanor. “I’m sorry but there is nothing until later this afternoon. You just have wait patiently,” she says, practically grinding her teeth. “Can you check again, please?! I can’t miss this tournament! My team needs me! I’m their leader!” Masamune whined. “Sir, I’ve already told you. There are no more flights to Japan until this afternoon. So please come back later. Understand?” the flight attendant says with malicious yet pleasant tone. Her patience with Masamune has run out. He can feel the lady’s ire rising before him. “Yes…ma’am,” Masamune replies with a hard swallow.